Vogue is a high-end Fashion and Lifestyle magazine which has expanded to variations across 23 national and regional editions. It is owned and published through Condé Nast. Vogue, was founded in 1892 by Arthur Turnure and was released originally as a weekly publication. The first ever cover of Vogue - US Edition, 17th Dec 1892. "Turnure's intention was to create a publication that celebrated the "ceremonial side of life"; one that "attracts the sage as well as debutante, men of affairs as well as the belle." From its inception, the magazine targeted the new New York aristocracy, establishing social norms in a country that did not value class and ceremony as much as England or France. The magazine at this time was primarily concerned with fashion, with coverage of sports and social affairs included for its male readership." Overtime the magazine has progressed and changed with societies norms and conventions, and also changes depending on the country of the magazine, as different cultures feature different types of fashion, designers and lifestyle advice. The first ever published magazine was the American edition released on Dec 17th 1892. "Vogue" is the French translation of 'In-Style'. 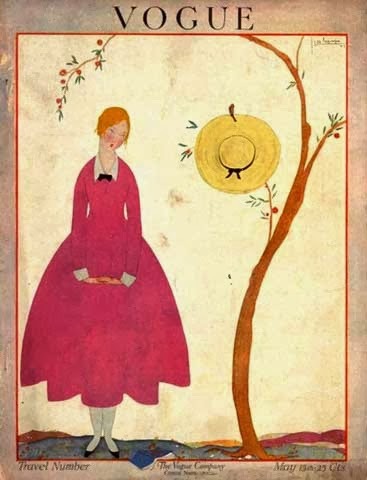 "Laird Borrelli notes that Vogue led the decline of fashion illustration in the late 1930s, when they began to replace their celebrated illustrated covers, by artists such as Dagmar Freuchen, with photographic images. In the 1960s, with Diana Vreeland as editor-in-chief and personality, the magazine began to appeal to the youth of the sexual revolution by focusing more on contemporary fashion and editorial features that openly discussed sexuality. Toward this end, Vogue extended coverage to include East Village boutiques such as Limbo on St. Mark's Place, as well as including features of "downtown" personalities such as Andy Warhol, "Superstar" Jane Holzer's favorite haunts. Vogue also continued making household names out of models, a practice that continued with Suzy Parker, Twiggy, Jean Shrimpton, Lauren Hutton, Veruschka, Marisa Berenson, Penelope Tree, and others. In 1973, Vogue became a monthly publication, after being bi-weekly for decades. Under editor-in-chief Grace Mirabella, the magazine underwent extensive editorial and stylistic changes to respond to changes in the lifestyles of its target audience." 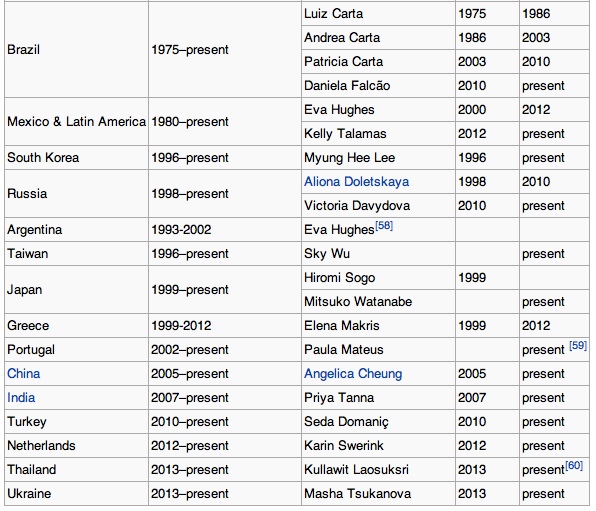 Below are the different publications of Vogue which are released monthly across the world. 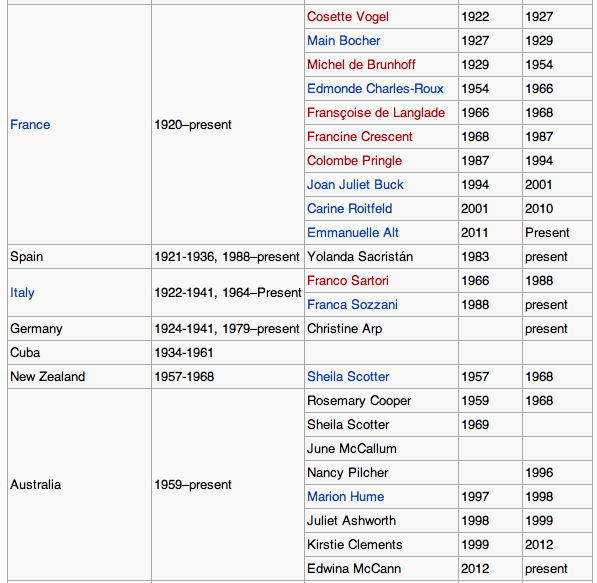 The following information has been taken from Vogue's wikipedia page. This is to ensure all the background is covered through research, so I can gain a better understanding of the background of the magazine, as well as thinking more about which direction I would like to take the research project in. "In 2005, Condé Nast launched Men's Vogue and announced plans for an American version of Vogue Living that launched in 2006 (an Australian edition already existed at the time). Men's Vogue ceased publication as an independent publication in October 2008 and is now a twice-yearly extract in the main edition. Condé Nast also publishes Teen Vogue, a version of the magazine for teenage girls in the United States. South Koreaand Australia publish a Vogue Girl magazine (currently suspended from further publication), in addition to the Vogue Living and Vogue Entertaining + Travel editions. Vogue Hommes International is an international men's fashion magazine based in Paris, France, and L'uomo Vogue is the Italian men's version. Other Italian versions of Vogue include Vogue Casa and Bambini Vogue. Until 1961, Vogue was also the publisher of Vogue Patterns, a home sewing pattern company. It was sold to Butterick Publishing which also licensed the Vogue name. Vogue China was launched in September 2005, with Australian supermodel Gemma Ward on the cover flanked by Chinese models. In 2007 an Arabic edition of Vogue was rejected by Condé Nast International. October 2007 saw the launch of Vogue India, and Vogue Turkey was launched in March 2010. On 5 March 2010, 16 International editors-in-chief of Vogue met in Paris to discuss the 2nd Fashion's Night Out. Present in the meeting were the 16 International editors-in-chief of Vogue: Wintour (American Vogue), Emmanuelle Alt (FrenchVogue), Franca Sozzani (Italian Vogue), Alexandra Shulman (British Vogue), Kirstie Clements (Australian Vogue), Aliona Doletskaya (Russian Vogue), Angelica Cheung (Chinese Vogue), Christiane Arp (German Vogue), Priya Tanna (Indian Vogue), Rosalie Huang (Taiwanese Vogue), Paula Mateus (Portuguese Vogue), Seda Domaniç (Turkish Vogue), Yolanda Sacristan (Spanish Vogue), Eva Hughes (Mexican Vogue), Mitsuko Watanabe (Japanese Vogue), and Daniela Falcao (Brazilian Vogue). Since 2010, seven new editors-in-chief joined Vogue: Victoria Davydova replaced Aliona Doletskaya as editor-in-chief of Russian Vogue; Emmanuelle Alt became French Vogue's editor-in-chief after Carine Roitfeld resigned; Edwina McCann became Australian Vogue's editor-in-chief after Kirstie Clements was fired; Kelly Talamas replaced Eva Hughes at Vogue Mexico and Vogue Latin America, when Hughes was named CEO of Condé Nast Mexico and Latin America in 2012; and Karin Swerink, Kullawit Laosukrsi, and Masha Tsukanova were appointed editors-in-chief of the newly launched Netherlands, Thailand, and Ukraine editions, respectively." Anna Wintour became editor-in-chief of American Vogue in July 1988. Noted for her trademark bob cut and sunglasses, Wintour sought to revitalise the brand by making it younger and more approachable; she directed the focus towards new and accessible concepts of "fashion" for a wider audience. Wintour's influence allowed the magazine to maintain its high circulation, while staff discovered new trends that a broader audience could conceivably afford. For example, the inaugural cover of the magazine under Wintour's editorship featured a three-quarter-length photograph of Michaela Bercu, an Israeli super model, wearing a bejeweled Christian Lacroix jacket and a pair of jeans, a departure from her predecessors' tendency to portray a woman's face alone; according to the Times, this gave "greater importance to both her clothing and her body". As fashion editor, Grace Coddington wrote in her memoirs, the cover "endorsed a democratic new high/low attitude to dressing, added some youthful but sophisticated raciness, and garnished it with a dash of confident energy and drive that implied getting somewhere fast. It was quintessential Anna." Wintour continues to be American Vogue's editor-in-chief to this day. When Wintour was appointed head of Vogue, Grace Mirabella had been editor in chief for 17 years, and the magazine had grown complacent, coasting along in what one journalist derisively called "its beige years". Beige was the color Mirabella had used to paint over the red walls in Diana Vreeland's office, and the metaphor was apt: The magazine had become boring. Among Condé Nast executives, there was worry that the grand dame of fashion publications was losing ground to upstartElle, which in just three years had reached a paid circulation of 851,000 to Vogue 's stagnant 1.2 million. And so Condé Nast publisher Si Newhouse brought in the 38-year-old Wintour, who through editor-in-chief positions at British Vogue and House & Garden, had become known not only for her cutting-edge visual sense, but also for her ability to radically revamp a magazine to shake things up. Ryan Lochte, with Hope Solo and Serena Williams in June 2012. 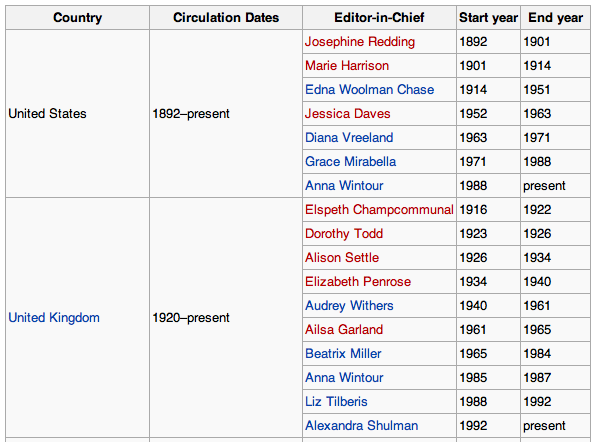 The information shown below shows the circulation dates and editor-in-chief of each version of the Vogue Magazine. Alexandra Shulman remains the e-i-c for the UK Vogue, and Anna Wintour for the US Vogue. Each different editor will have a final say on the magazine and the content, giving each different version a slightly different flair.